Do you like to live life on the edge? Are you a daredevil? Do you like to stare fear right in the eye and fight it? If the answers to all these questions are in affirmative then you will love PBR-Professional Bull Riders. This is a sport that’s dubbed as “the hardest sport on dirt” and for good reason too. 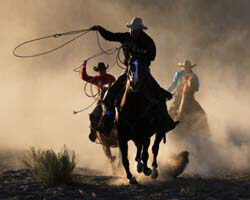 All a rider has to do is to ride a bull for eight seconds only without dropping off it, sounds easy? Think again, especially if the bull is a beast that’s kicking, moving, snorting and hell bent on throwing the rider off its back and stomp on him. The PBR-Professional Bull Riders INC is an association that was formed in 1992 by a group of around 21 bull riders chipping in with US$ 1000 each. It was a low key beginning but the fear factor and the unexpected nature of the sport soon propelled it to heights never seen before. These very same characteristics drove major sports channels to the PBRto broadcast their events live and that helped grow the viewership to unprecedented heights. The prize money for the event was only about US$ 250,000 in its early days but that has now rocketed up to US$ 11 million now. This huge increase in support of the sport and its events has made it ever easy for the management to sell PBR-Professional Bull Riders tickets well in advance. PBR-Professional Bull Riders is all about eight seconds of fear for the riders riding the bull as well as the audience, and gives an extra thrill to everyone. Picture this; a rider gets ready to ride a beast, he grabs and wedges a rope that goes all the way to the harness that’s around the bulls mouth, saddles the animal and then when he is ready he slaps the bull to go for it. The bull takes the cue and bang the gates open, the bull moves a few meters forward, and the crowd starts to count the seconds. Four judges, two to judge the rider and two to judge the bull, look on closely to see what happens. The bull kicks its legs, moves back and forth and jerks its head and body to throw the rider down and hurt him. The fear of the unexpected keeps everyone glued to the action and when the eight seconds are up and the rider is still on top of the bull the support staff comes to control the animal and help the rider get off but if he falls over before the eight seconds are over, which happens to approximately a third of the total number of riders, then the rider can get seriously injured or in some instances even get killed before the paramedics team comes to save him. PBR-Professional Bull Riders started as a sport with a rural following but now the urban population also enjoys this sport. This has further maximized the option of the PBR team to cash in on the marketing front. The show is made more watchable due to the amazing polytechnics and the music that accompanies the main event. The PBR-Professional Bull Riders has events every weekend in different cities and it now has over 800 registered members from different countries around the world. The PBR team has worked brilliantly to market this sport and that has helped them to successfully stage over three hundred events in different parts of the globe. The main premier event of the annual PBR’s tour is called the “Built Ford Tough Series”. It is a series of 31 events in different parts of the US held under the umbrella of PBR. Amazing music accompanied by equally dazzling polytechnics and special effects starts the event. Each event has 30 top riders of the world at that current time to fight for the title which ends with the grand finale in Las Vegas, the permanent venue for the PBR-Professional Bull Riders World finals. Since 2007, PBR has held a world cup of the bull riders where the top twenty five bull riders from around the world come face to face to be crowned the world champion. If you have a daredevil in you, someone who wants to experience the thrill of coming face to face with the unexpected all you need to do is to grab PBR-Professional Bull Rider tickets and watch it live at the arena. Q:Do you have any pbr professional bull riders tickets left? A:Sure, we still have plenty of pbr professional bull riders Tickets available. Order your share right away! Q:What are the prices of pbr - professional bull riders tickets here on your website? A:You can get the details about the prices of Pbr Professional Bull Riders Tickets by looking through our page. Q:Where can I get all the information I need about the pbr professional bull riders eugene tickets? A:You can get all the information you need about the Pbr Professional Bull Riders Eugene Or Tickets from the pricing section on our website. Q:Can I get free pbr professional bull riders laredo tickets? A:No, we don't offer free Pbr Professional Bull Riders Laredo Tx Tickets. Q:Whats the latest till I can buy the pbr professional bull riders winston salem tickets? A:The tickets are sold on first come first served basis so you can Pbr Professional Bull Riders Winston Salem Nc Tickets as long as they are available. Q:I lost my pbr professional bull riders houston tickets. Can i get a refund? A:Pbr Professional Bull Riders Houston Tx Tickets can only be refunded in case of event cancellation, it is not possible otherwise. Q:Will prices for adults and kids be different for pbr professional bull riders tickets? A:There are no specific rules about that so it varies from venue to venue. We suggest you contact the arena before buying your Pbr Professional Bull Riders Tickets.